I look back on the many transformations that have taken place in my lifetime. Some were “mini” and some huge. In my college years, I blossomed from a shy, introverted girl who only knew of studying and babysitting since my teens into a more confident woman who socialized and made friends easily. Several years later I transformed my body from one unaccustomed to exercise to one that was strong and supple, capable of racing in triathlons, running ten miles with ease, and practicing yoga for six hours or more a day at retreats and workshops. However, what I really want to talk about is the personal transformation that took place when I moved to Colorado in 2005. I moved to Colorado after 23 years of a life I really enjoyed in Washington DC. I had lived on the East Coast my entire life, but I had been drawn to the West for many years. In the early 2000s, I visited friends in Colorado to ski and hike – the beginning of my love affair with this state! I looked for a job in Denver for two years. Finally the stars aligned: I got a job in Denver and my move was paid for! 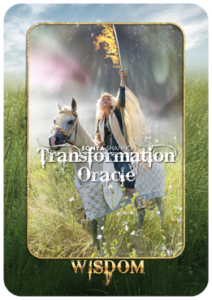 “The seeker embarks on a journey to find out what s/he wants and discovers, along the way, what s/he needs.” And so this particular transformation in my life began with the first card of the deck: JOURNEY, in the Earth element and in the Beginning phase of Transformation. I was on top of the world! This new beginning was a physical journey in the Earth element, moving my body, home and possessions 1700 miles away. It also was to be journey of the heart and spirit. My instincts, symbolized by the dog, were finely tuned, and led me to so many interesting places and people. Among them, my future husband, and INITIATION came in to play. 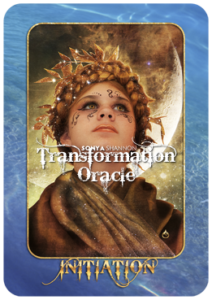 Another Beginning card, Initiation, in the Water element. I had come into a new position with new knowledge, and the associated responsibilities – I was a wife for the first time in my life! I was ready to be with a man who met me on every level and connected deeply to my heart. I was finally victorious in finding a mate and husband, and we called ourselves the New Paradigm. But, alas, this was not to be; the bliss turned to blame, control and verbal abuse. 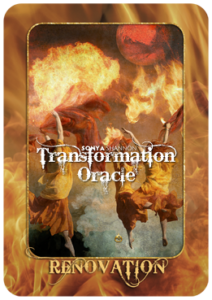 The beginning of the ending is captured in the RENOVATION card, in the Fire element and in the Ending phase of Transformation. We divorced two years after marrying. With a still-tender heart, I put myself into action. I made renovations on my house, I spent several years giving away or tossing nearly every reminder he had left behind. 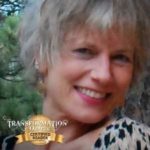 I explored my soul path, taking classes at Mile Hi Church, obtaining Reiki certification, and came back to A Course in Miracles. I breathed life back into my creative talents. I made literal space in my closets and figurative space in my heart for another man. Once again, I was in my power, but it felt different than place of the INITIATION card. At that time, everything was new and exciting, and this time I was, well, wiser. My mind was clearer and more awake, I was more discerning. Through my past experience, I was determined to never be dominated by anyone again. All of that was about eight years ago, and much growth has since taken place. It is a continual process of examining the patchwork of my life, accepting parts of me or my experiences – whether perceived as “good” or “bad” – and finding a way to rework it all into my being-ness. This place is best expressed by the RECYCLE card. 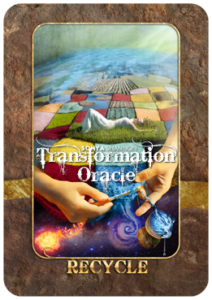 Like the WISDOM card, this card is also in the Refinement phase. It is of Earth yet contains all elements, reminding me that my physical body is in this world, my mind is of the ether, my emotional heart flows like water, and my spirit comes from the cosmic fire. 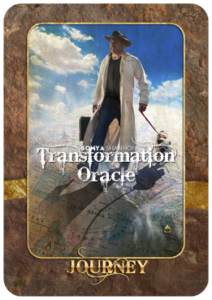 Learn how you can become a Certified Transformation Oracle Reader like Trisha Michel! Trisha in Warrior III yoga pose.